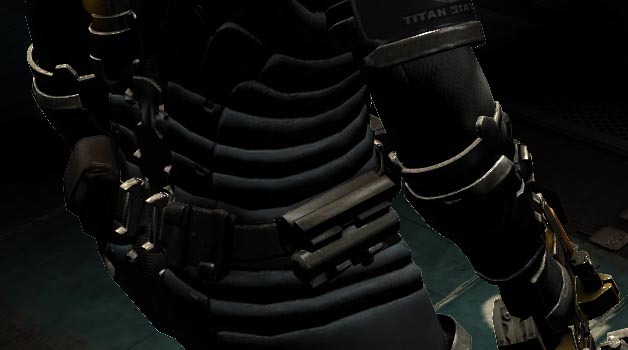 Out of the box, Dead Space 2 has poor support for anti aliasing. For the moment, AMD card owners below the 6000 series are more or less out of luck. However, having an Nvidia card affords you 2 options, thanks to an inventive gaming community. In this updated article, I will show you both methods to force AA on Dead Space 2 PC version 1.0 and the compromises required of both. Solid Statement: The community has identified 2 ways to force Dead Space 2 anti aliasing using Nvidia Inspector, but neither method is perfect. As I said, both methods have their pros and cons. I made a simple table to quickly compare them below. 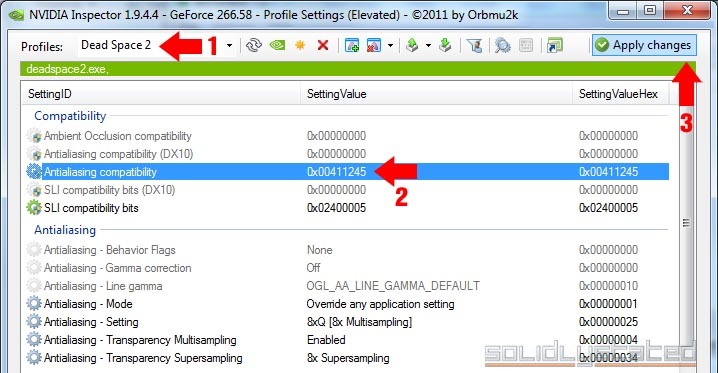 The “Flags” are values that you set in the Nvidia Inspector to force AA. The AA screenshots here are set at 8x Multisampling. I tried 4x, 16, and 32x, but they all looked identical. No Anti Aliasing, Very High Shadow Quality. Note the very jagged edges. Flag 0x00411245, Very High Shadow Quality. Note the somewhat jagged edges with white dots. Flag 0x004030C0, Very High Shadow Quality. Note the missing shadows! Flag 0x004030C0, Normal Shadow Quality. Note that shadows came back, but low quality. Since neither method is perfect, we can only hope that EA will release a patch to properly handle this (don’t hold your breath). For method 1: Using flags 0x00411245 or 0x00401045 will slightly improve the jagged edges, but you will start to notice the white pixels on many of those edges and especially Isaac’s suit when standing in the light. Some people might say you’re just trading one issue for another with this method. It looks worse when its moving. For method 2: Using flags 0x004030C0 isn’t a much better option. However, it provides great AA with smooth edges. Isn’t that why you are reading this to begin with? However, this method has 3 major drawbacks. If you use this AA option, then you can no longer (safely) Alt+Tab out of the game. When you switch back to it, the lighting will be out and you have to end the game and restart to get it back. The second issue is worse. As soon as you enter a new areas or trigger cut-scenes, the shadows have a tendency to vanish completely. You can get them back by pausing, changing shadow quality to high, accepting twice, and then switching back to normal, but that might only last a few minutes. I always notice them gone after a cut-scene event. The last issue is that you must turn down the Shadow Quality setting to normal. If you try to use high or very high, no objects will cast shadows ever. Either way, there’s your fix. I’ll let you decide which fix, if any, to use. Good luck! I tried this, though I had tried 4x MSAA + 4x SGSSAA, and the image quality was quite blurred out as compared to 8x MSAA + 8x SSAA, now I threw in 32x CSAA (since its still got 8x MSAA) along with 8x SSAA and also turned on FXAA, FXAA helps fixing some aliasing on the stairs. Overall the image produced by 8x MSAA is jaw dropping awesome IF you turn off the shadows because they’re a shame at normal and missing at very high.